Trade fabricator Pearl Windows has become one of the first companies to switch to Mila’s new HERO hardware for its TBT window range. 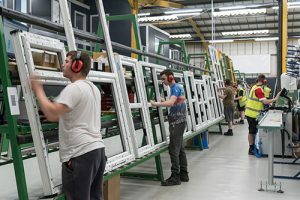 The Bolton-based manufacturer was quick off the mark when Mila launched the new hardware back in May, and says it is already getting positive feedback from customers operating in the commercial and social housing sectors. Like all of the products in Mila’s Hardware Essentials to Rely On (HERO) range, the emphasis with the new TBT hardware is on value, and on providing reassuringly well designed and high quality options for an increasingly competitive market. For Pearl, the appeal of the Mila TBT hardware was that it was a cost-effective option which could meet every single one of its rigorous performance criteria. Mila has partnered with the award-winning manufacturer Axor to produce the TBT range at its state-of-the-art facility in Ukraine, and all of the products in the range have been fully tested and accredited to all the necessary UK endurance and corrosion resistance standards at the IFT Rosenheim facility in Germany. They come with a market-leading 10-year mechanical operation guarantee direct from Mila. Mila’s HERO TBT range is suitable for windows from 400mm to 1520mm wide and 370m to 2390mm high. It includes stand-out features such as heavy-duty hinges with a weight capacity of 130kg as standard and a clever mis-handling device which acts as a sash lifter to ensure precision engagement of the sash when closing. Mila has previously impressed Pearl with the design and innovation on products like friction stays and hinges, including its hugely popular ProSecure door hinge.